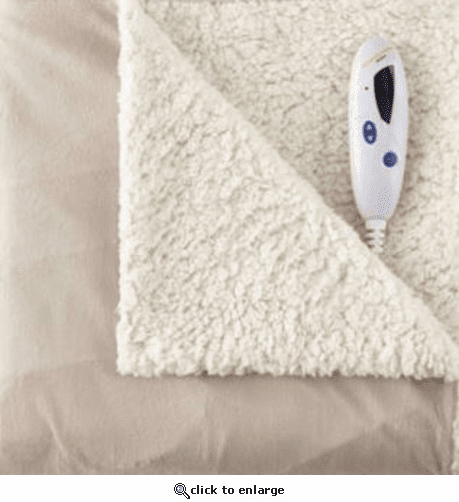 Biddeford's warmest and most cuddly heated blanket is made from luxurious micro mink plush fabric on one side and a super soft fluffy sherpa on the other side. The perfect combination of warmth and comfort for those long cold winter days and nights! The digital controller allows you to choose from 10 heat settings to provide the perfect warmth level. It also features a 10-hour automatic shut off for added safety. This heated throw is machine washable and dryable and comes with a 5 year warranty. Long gone are the days of simply passing electricity through a wire in a blanket. Today you can expect the warm soothing comfort that comes from a quality Biddeford Blankets product. Our heated products are more advanced than ever, and we will continue to strive to provide you with the latest innovations and technology. Biddeford Blankets products allow you to not only rest comfortably, but rest assured as well. Though Biddeford Blankets still sends electricity through a single resistive conductor to provide heat, the similarity between today's heating wire and that of old end there. Your Biddeford Blankets product utilizes newer, three part, heating wire technology in the form of a Fusible Linked Dual-Wound Wire. This wire uses a specially shaped and helically wound Resistive Heating Conductor in order to provide more efficient heating in the space provided. The Resistive Heating Conductor is then surrounded with a Fusible Material. Simply put, this means that this material will signal at a specific temperature. And finally, a continuous Senor Wire is then wrapped around the Fusible Material. The Fusible Linked Dual-Wound Wire will provide heat in a short amount of time after turning power on. The Sensing Wire acts like a thermostat by sensing the change in temperature and accurately telling the controller to stop or add more heat. The middle Fusible Material will react at any hotspots in the blanket that are at abnormally high temperature conditions. The Controller is designed to detect this reaction and immediately shut off power to the blanket. Controller Features: Analog or Digital, Desktop or Handheld, Biddeford Blankets controllers all posses the following features to aid in your comfort and safety. Our Auto-Off feature provides the sense-of-mind that allows you to enjoy your heated product to its fullest extent as you cozily drift off to sleep, not having to worry about waking up to turn off the blanket. My husband sleeps better since he has his electric blanket. It's the best light weight blanket I could find. Very warm and cozy. Control lead could be a bit longer but maybe that's just my opinion. ProsGood price and product works well Warm and cozy! ConsThe control and power cord exit and enter in the same place on the side of the product. Control wire could be a little longer.